Many larger gardens benefit from windbreaks. If you live in an exposed location – either to wind, snow, or both, then a properly designed windbreak will create a haven of calmness and shelter, in which your garden – and your family too – will flourish. A sheltered location creates a micro-climate, which is an area where the seasons are a little longer, the growing conditions more hospitable, and where a greater variety of plants can be grown. A windbreak, or shelter belt, is different from a screen, which is just planted for privacy. A screen is usually a row, or at most a double row, of a single type of plant, and although a dense screen will have some effect on wind, and slow it down a little, its benefits will not be as great as you might think. A properly-planted windbreak has several different kinds of plants in it, to slow the wind gradually, and over a much larger area, than a single row of trees can ever possibly do. Of course, a windbreak takes up more room, and it may not be possible in a smaller garden, but if you have the room for one, the space it takes up will be balanced by the benefits it brings. 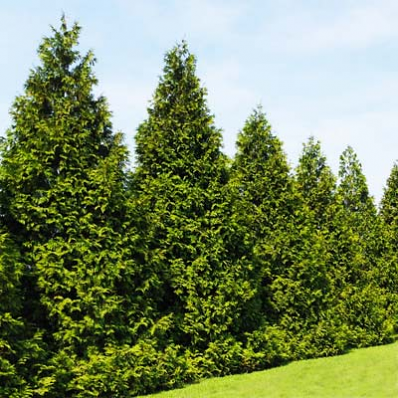 When choosing plants for it, Thuja Green Giant stands out as a number one choice for the vital core component, so let’s look at windbreaks, and how this fantastic plant can become an integral part of yours. What are the Benefits of a Windbreak? While it’s obvious that a windbreak slows windspeed, the benefits of that effect are much more extensive than you might imagine. Speeds are typically reduced between 50% and 90%, depending on the actual speed. By reducing wind-chill, heating costs in your home are reduced substantially, by up to 44% in studies. The garden is enjoyable to be in for more days of the year, a big bonus for family pleasure. Crop yields from your vegetable and fruit gardens will increase dramatically, as well as the quality of the crop, especially fruits. You will be able to succeed with a greater variety of crops, and any animals you are raising will grow faster and be healthier. Wild-life such as birds will benefit, from the increased nesting-sites, food sources, and winter shelter, as will many other animals and beneficial insects. How do I Create a Good Windbreak? A 35-foot windbreak creates a shelter zone up to 1,000 feet away, but since the effect is minimal towards the end of that range, the effective protected zone is upwards of 500 feet. So when locating windbreaks, plan on that as the area that will be protected. Find out where the prevailing and strongest winds come from, and place the windbreak at right-angles to that direction. If strong winds are likely to come from more than one direction, you may need a curved or angled windbreak. To be effective in preventing the wind simply coming around the planting, it should be at least ten times as long as the expected height of the trees in it. A windbreak consists of several rows of trees and bushes, with taller ones in the middle and shorter ones on the outsides. Three to five rows are normal, and these are spaced 20 feet apart for the taller plants, and 15 feet apart for the smaller ones. Within the rows, taller plants go 12 feet apart, and smaller ones can be as close as 6 feet from each other. Perhaps surprisingly, the goal is not to create a solid wall, but rather a filter to the wind. Too solid a planting will cause turbulence, which can be worse than the original wind. 50% final density is about right, so plants should not go too close together. The two central rows of a windbreak are usually a row of deciduous trees and a row of evergreens. It is as that core row of evergreens, which is perhaps the most critical row of all, that Thuja Green Giant is the perfect choice. Only in the coldest places would another choice be needed. With its extraordinary rapid growth, it will itself create shelter for the slower-growing plants in the other rows, acting as a nurse to their growth. Its upright habit, combined with good width and density, makes it idea for the core of any windbreak, providing 365-days a year strength and stability to any planting. At 12 foot spacing in the rows, they will give just the right density for ideal wind filtering. 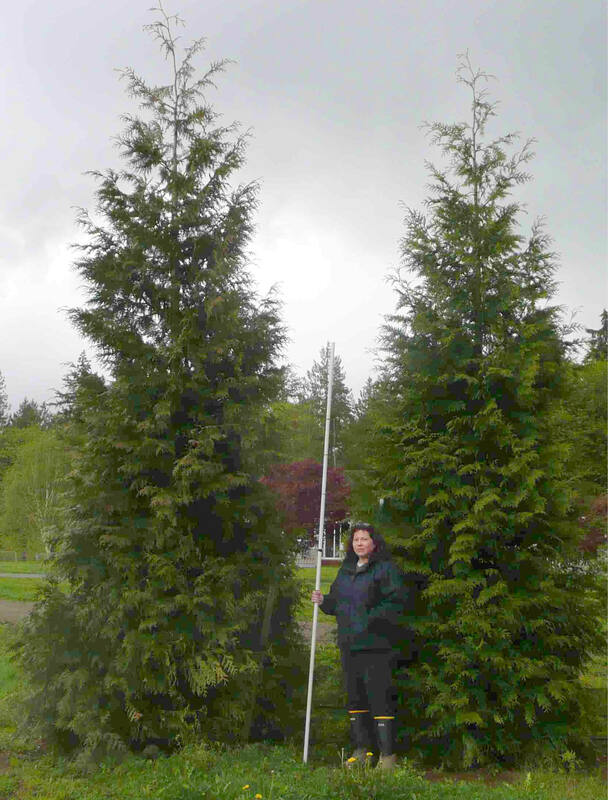 For a simple but effective windbreak, plant two rows of Thuja Green Giant, 40 feet apart, with a suitable deciduous tree as a row down the middle. Finish off with a row on either side of a mix of medium-sized evergreen and deciduous shrubs, preferably with flowers and berries. You won’t need to trim Thuja Green Giant for good structure, so they will grow as rapidly as they can. In trials at the University of Arkansas, tiny starter-plants reached an amazing 10 feet in just 7 years, way ahead of anything else in their trial plantings. Before you know it, your windbreak will be looking great, and starting to do its job. The other plants will grow faster too, with the shelter it provides. Because it is free of pests and diseases, it will never need any special care, and after some initial watering in the first season, it will take care of itself. The plants in a windbreak all need to be self-reliant, naturally sturdy, drought-resistant and reliable. Thuja Green Giant tops the list in all those qualities. So when you come to create a windbreak for your property, to give yourself the best garden experience you can have, make sure that Thuja Green Giant is at the heart of it – a choice you will never regret. 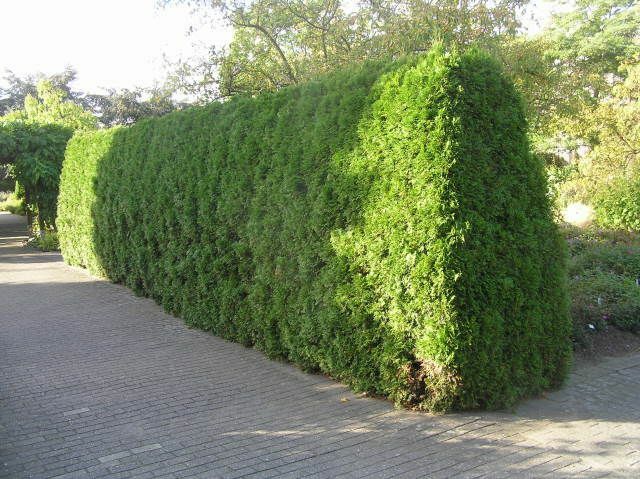 Thuja Green Giant is a very popular hedging plant, partly for its amazingly rapid growth, but also for it hardiness and how easy it is to make great hedges and screens with this terrific plant. Once your hedge is growing strongly – and that won’t take long – it’s time to settle into some long-term care, and that is where some gardeners need a hand in doing things right. If you make mistakes – and we all can – then you might end up with a hedge that is less than you dreamed about. There is one problem that we see quite often on older hedges, after the first 5 or so years of regular trimming. The lower part of the hedge has started to thin out, and all the growth is at the top. Gradually the lowest branches die, causing bare spots to develop, and they just don’t seem to re-sprout. Eventually you end up with a hedge that has a couple of feet of bare trunk along the bottom, even though the upper parts are green and healthy. Gardeners often ask why this has happened, and the reason is usually the same – poor trimming habits. There is not much that can be done to bring back that growth once it goes, so if you want the maximum life from your hedges, trimming properly from the start is the secret. Let’s look at the commonest reasons why Thuja hedges become thin and bare at the bottom. The good news is, it doesn’t have to happen to you if you follow a few simple rules. This is essential when you plant your hedge. Some people are so anxious for a solid hedge they pack the plants root-ball to root-ball. That is a mistake, because the plants respond to the shade that makes by immediately growing up, not out, and the bottom doesn’t get a chance to thicken and develop at all. Allow at least 3 feet between the plants, so that there is room and light to build a solid base for your hedge. Don’t worry, Thuja Green Giant is so vigorous and fast-growing, it is going to fill in sooner than you thought possible. This is a big part of the secret to a solid, dense hedge right to the ground. Don’t wait until your hedge reaches the height you want, start trimming lightly as soon as it begins to grow, shortly after you have planted it. Just take a couple of inches off at a time, so that you get lots of small branches developing close in to the main stems. As these grow they will give you a dense structure that will stay that way for many, many years. Don’t forget to trim the top a little too, you want thick all the way up. Nobody want their hedge to take up the whole garden, so we always want to keep it thin, not allow it to spread too wide. But we must be reasonable, and allow enough thickness for the branches to develop a dense structure. Especially at the bottom, it must be wide enough to support the smaller branches that give us a thick hedge. When planting, reckon on a mature width of at least 3 feet, and remember that gradually, over time, it will add ½ an inch a year, so eventually that will become 4 feet, no matter how tightly and carefully you trim. Although we are talking about this one last, it is the most important one, and it’s an easy one too. When your Thuja Green Giant bushes grow, they want to grow tall, and a lot of their energy will go to the top of the plant. So growth in the top couple of feet will always be stronger, and the shoots longer, than lower down. This is a big part of why, eventually, the bottom starts to thin out, as more and more water and food goes to the greedy upper parts. When we come to trim, we need to take more growth from the top than from lower down, to push that growth back down into the lower branches. If you trim off the same amount all over the hedge the upper part will start to bulge out, taking the lion’s share of the energy, and also shading the lower growth, which just makes the problem worse. The answer is simple. When you are trimming, cut more from the upper parts than the lower ones, so that the side is flat, but it is leaning inwards by a few degrees. Some professional hedge-trimmers make a simple structure with a few pieces of wood as a guide. Take three pieces of wood, one 6 feet long, one 3 feet long and one 6 feet 8 ½ inches long. Join them together to make a triangle. You will see it has a right-angle in one corner, but if you attach the 6-foot piece at a point 6 to 7 inches inside the corner of the 3-foot piece, that 6-foot piece will make an angle of about 80 degrees to the vertical, not 90 degrees. If you hold the resulting triangle up to the hedge, with the small piece horizontal on the ground, that is the perfect slope for the front of your hedge. Just lean it against the hedge as you trim, and you will always keep the same slope, no matter how big your hedge is. If that sounds too complex, don’t worry. Most hedge-trimmers just judge it by eye, looking for a slight inward lean, and with a bit of practice that is the best way for all but the most formal, large hedges. If you can see the hedge from one end, and you have trimmed it correctly, you will see that the side has a uniform inward slope. It is hardly visible at all when you look at the hedge straight on. 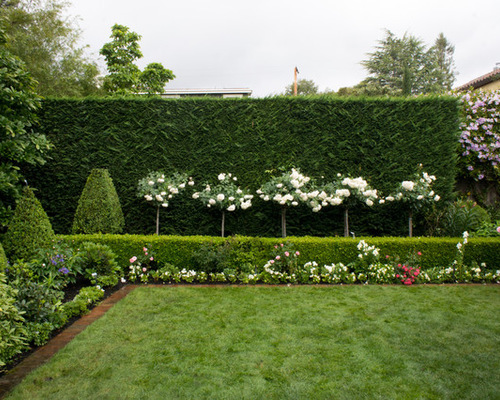 If you follow these simple rules, your hedge will be the envy of your friends and neighbors. When they ask how you did it, just pass on the link to this blog. Thanks! Thuja Green Giant is known for its rapid growth. This is a major reason why so many people are choosing it for screens and hedges – besides its beautiful green foliage and attractive appearance. But of course, just how much growth it produces in a year is not fixed. Some people might complain that their plants didn’t grow as fast as they were ‘supposed to’, but the causes can almost always be traced back to the way they were grown, not to the plants themselves. There are several things you can do to speed things up, and get that hedge of your dreams as soon as possible. The secret to good growth of all plants is in the soil. The difference between success and mediocre results is how much attention you pay to preparing it for the plants you put into it. Some people even say you should spend as much on the soil as you do on the plants, although in truth that is not necessary. None the less, it does get across the idea that making your soil better is as important as choosing good plants. The first step in preparing the soil is to dig it. You can do this by hand, with a spade or fork, or you can use a rototiller. If you use a tiller – which will save a lot of time – then rent the biggest you can operate. Many people who use tillers do a bad job, because the machine will trick you by making the top layer of soil look nice, while doing nothing just a few inches down. You need to dig 12 inches deep if possible, which is the full depth of a full-sized spade, and the depth when the tines of the tiller are completely buried in the ground. It might take you several runs along the area to get it that deep, but it is important to do it. Prepare the area for a hedge at least 3 feet wide. The purpose of making the soil loose over a large area is to make it easy for the plants to quickly send out their roots into the soil in search of food and water. Only new roots can take up those vital things, so plants need to constantly be growing into new soil. If that soil is hard and compacted, they will need more time to do that, and may even not be able to do it at all. As well as digging, it’s best to add some kind of rich organic material to the soil. All soils benefit from it, from sandy ones to heavy clay. In sand, organic material holds water and adds nutrients as it decays. In clay, it also adds nutrients, but even more importantly, its coarse texture opens up the soil, allowing water to escape and air to enter. It doesn’t really matter a lot exactly what material you use, although most gardeners agree that rotted animal manures – cow, sheep or horse – are the richest and give the fastest growth. But home-made compost, rotted leaves, and peat-moss all do a similar job. Dig into the soil a layer between 1 and 4 inches deep, and mix it well down into the soil. Once your plants are growing you can replenish that organic content – which disappears over time, simply by mulching with it in spring. A layer a couple of inches thick is enough for that job. Now you are ready to plant, it is time to water. Begin by watering the pots the night before – if the root-ball is dry when you plant, there is a danger it will stay that way even after you water the ground. For a hedge the best approach to planting is to dig a trench a little wider than the pots, along the line you want. This makes spacing out evenly and getting the row straight a lot easier. Once you have the plants in the trench, put back most of the soil, firming it down around the roots. Now flood the trench with water – that way you get it right down into the soil. Once it has drained away, put back the rest of the soil. Mulch over the root area – but not against the trunks – will help conserve moisture. Water twice a week for the first month, then once a week after that for the rest of the season. Even if it rains, water anyway, as rain often does not penetrate dry soil very deeply at all. To maximize the growth in the years that follow, weekly watering from spring to fall will give the fastest growth. Only if your soil drains poorly can you over-water with a weekly soaking. A porous irrigation pipe makes watering very easy. Just connect it to a regular hosepipe, turn it on, and let the water flow for several hours – until the area is thoroughly wet. Try digging a hole in the earth after you think they have watered enough. You might be surprised to see that only the top few inches are wet. If that is true, water longer. Even with that soil preparation and watering, using a hedge fertilizer will accelerate the growth even more. It really doesn’t matter very much what type you use – solid or liquid, but the simplest to use is a slow-release form that is applied once in spring for the whole season. These can cost more, but the saving in time might be worth it to you. Whatever you use, follow the directions carefully. Giving too much is worse than giving too little, and if you don’t continue through the season, much of the benefit will be lost. It might seem counter-intuitive to trim plants before they reach the size you want – surely, they will get there more slowly if I do that? Not really. Taking an inch or two off the ends of the branches every couple of months in the early years will thicken up the growth, and encourage more shoots to develop. You will reach the final height with denser growth more quickly. A few wispy stems getting there first doesn’t really count now, does it? If you follow these simple steps, your Thuja Green Giant hedge will grow the fastest it can for you. Before you know it, the hedge of your dreams will be yours.